Hiking earlier today was a good test for the Edge, but what it really needed was a test ride. Fortunately, I was able to do just that at the tail end of the day. Sunday was gloriously warm for a late winter's day. While on the calendar it's still winter it seems like winter in Connecticut ends in mid February, when the days start getting longer and the deeply, cold winter nights mellow out. I pulled the Dillinger from the stable as the first bike to test it out on, not that one bike or the other would really matter. Like my previous Garmin bike computers the only safe spot to mount it and still keeping it visible is on the stem. I know one person that mounted his Edge 305 on his top tube but he rides a road bike and another guy that mounted his on the seatpost. While those are great alternatives to mounting it cuts off the visual aspect for the Edge, especially since the 705 has a map view. Operating the 705 is a little quirky. You can't turn it on with it plugged in to your commuter because it automatically thinks you are in data transfer mode. When you use the wall plug, it starts up with the screen in which it's trying to acquire satellites and it's very dark. There is no way to adjust the brightness, only the back lighting. Inside, you have to turn on the back lighting, but outside it's not needed at all. Also, there is no way to tell it to turn off looking for satellites, but once it can't establish enough satellites it will ask to operate without looking for them. 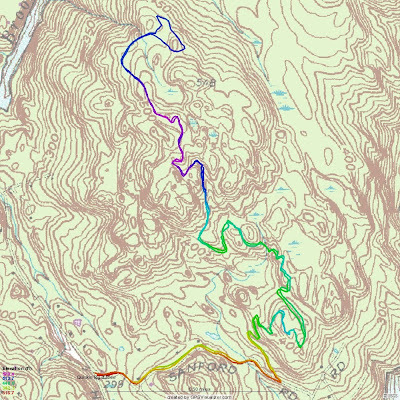 The big screen is really nice and having maps is good but the one thing I don't like is it doesn't work like my other Garmin GPSs, where if you want to follow a particular trail, it wont let you display it on the screen unless you create it as a workout and the workout display comes in the form of a highlighted route. That's fine I suppose but I guess they assume most people using this feature are following roads. I am going to try it out on the next time I ride. I think that was a feature on the 305 as well but since it didn't have maps all it showed you was a line. No change in riding with the larger to speak of, except for the bigger display. Size wise, it's bigger than the Edge 205/305 but a little bit smaller than the GPSMAP60s. My quick ride up and down the Gussy trail was sloppy, in the sense that I was riding sloppy. Bike is was making some more noises along the way. I had it up on the rack playing with the EBB because I thought to chain was too tight. I loosened the tension so that there is 1/8 to 1/4 inch of play in the chain but the sag isn't that noticeable and thus I don't think I have worry about the chain dropping. I probably should have lubed the chain, though. I found that you can effect your chain line by sliding the EBB left or right. I thought it would be grooved to prevent any lateral movement.